We bought a used IKEA Hemnes dresser on Facebook Marketplace that was perfect to transform into our baby’s dresser and changing table. We have several pieces of the IKEA Hemnes line in our home, so it would be ok as is. But, we decided to give it a mid century modern twist. Peep all the details of our tropical nursery here! Morgan has been going crazy buying baby clothes (surprises surprise) and this dresser has really big and deep drawers, which are perfect for tons of onesie storage. Something worth noting is that this makes for a really tall dresser. If you are short and looking for a changing table, this might not be the best fit for you. Also, we got the 6 drawer version of this dresser. 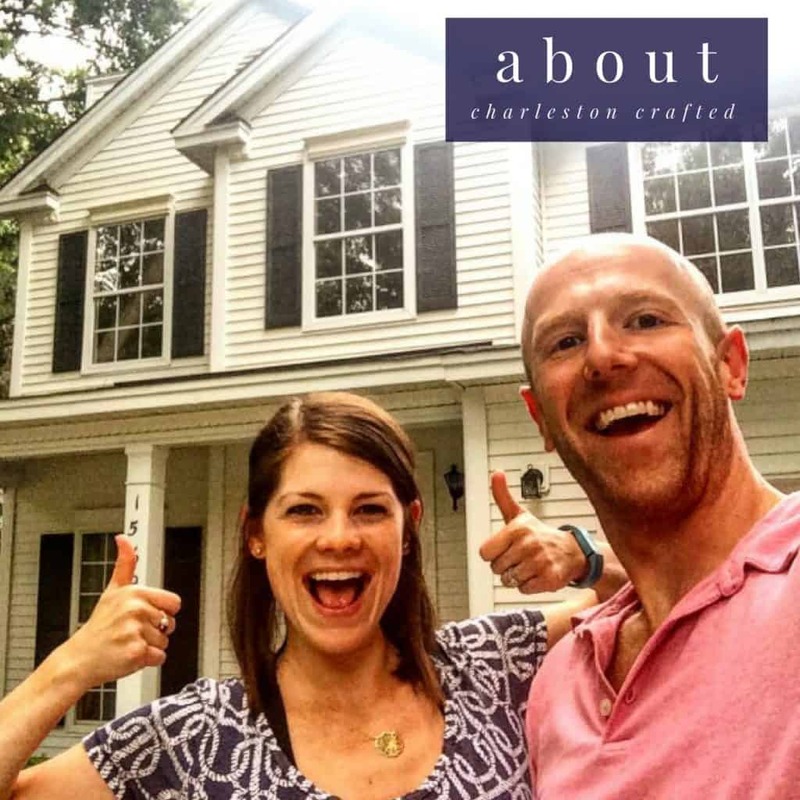 There is actually no Ikea in the state of South Carolina (I know, I know) and we bought this used on Facebook Marketplace for $30. 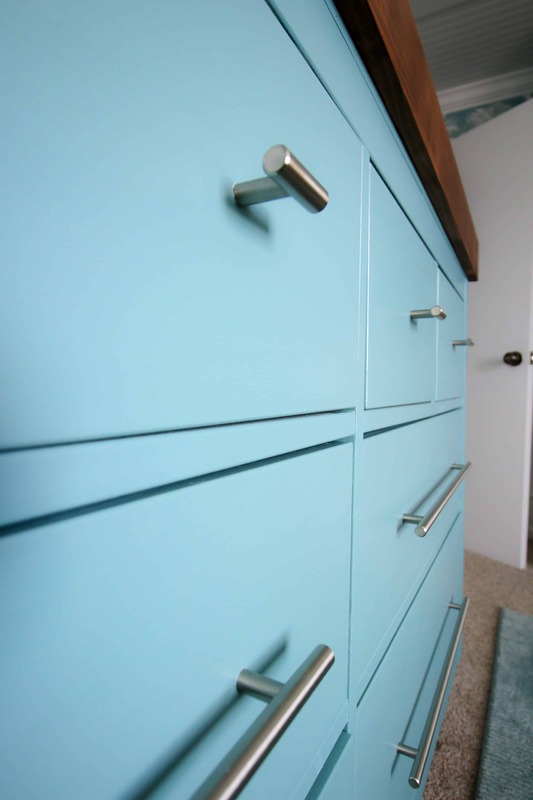 So, here’s our IKEA Hemnes dresser mid century modern hack! 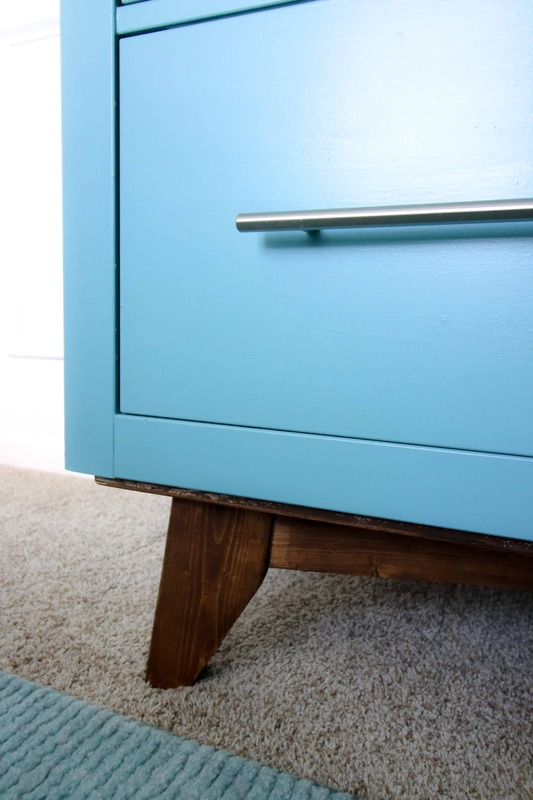 The first step of our IKEA Hemnes dresser mid century modern hack was to make a new shell of the dresser. We started by trimming off the overhanging edges from the top. Then, we sawed off the vertical legs on the bottom. This left us with a plain square shell. We painted the dresser and the drawers with Behr Marquee Tower Bridge. This plays off the nursery’s wallpaper and the inside of the closet. 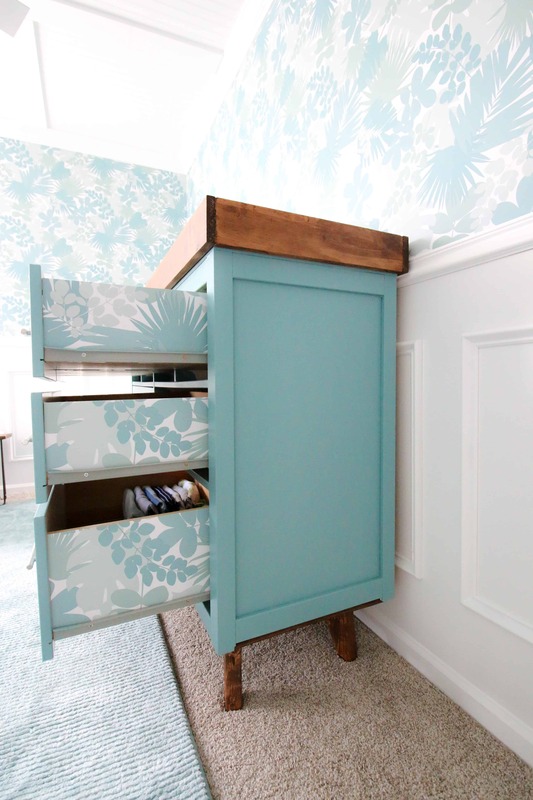 We styled the drawers by adding strips of scrap wallpaper and adding new hardware. Thanks to Liberty Hardware for sending us their steel bar knob pulls and steel bar drawer handle pulls. We used these pulls on the bi-fold closet doors as well, so they tie in nicely. These pulls are much more modern, but give a mid century look as well. The biggest part of this project was creating new legs that look MCM. No – not man crush Monday – mid century modern! Mark about 2 1/2 inches down one side and 1 to 1 1/2 inches in from the bottom. Draw a line between the two points and cut that off. 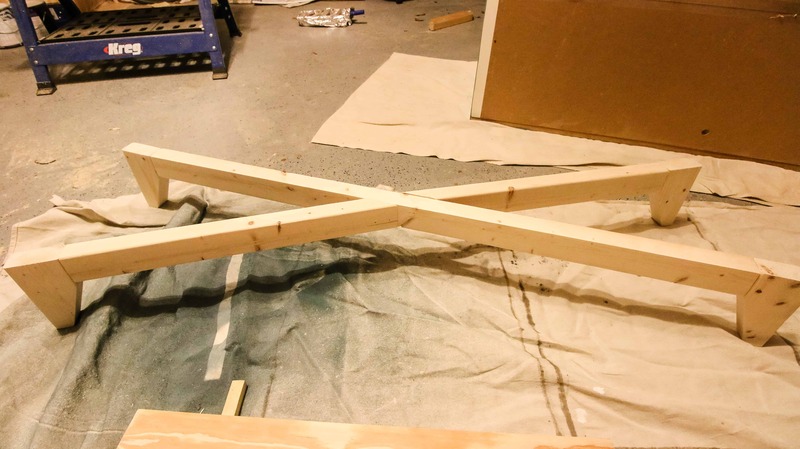 Cut two 2×4 pieces the length of the diagonal you want from corner to corner. For me, it was 49 inches each. Trim them down to only be 2 1/2 inches wide and with non-parallel 7 degree miters on each end. 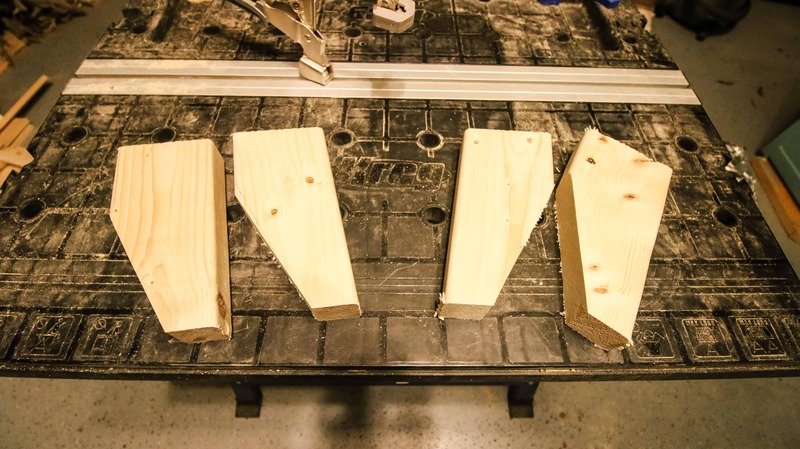 Use a Kreg Jig to connect two legs to each board. Line one of the leg sets up on top of the other to form an X-shaped base. 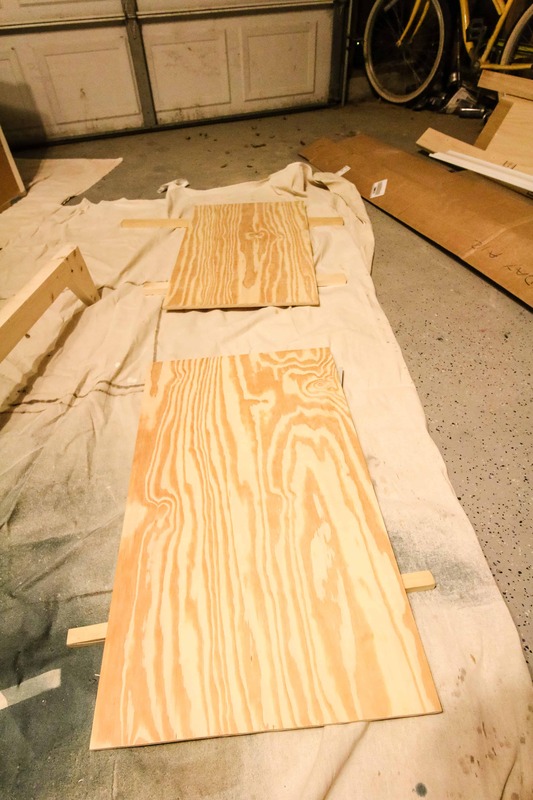 Cut out a gap on one of the boards and attach the two new boards to the board that is still whole using a Kreg Jig. Since this IKEA Hemnes dresser actually doesn’t have a solid base, you also have to cut plywood out to connect to the bottom of the dresser so that the new legs you made have somewhere to support. 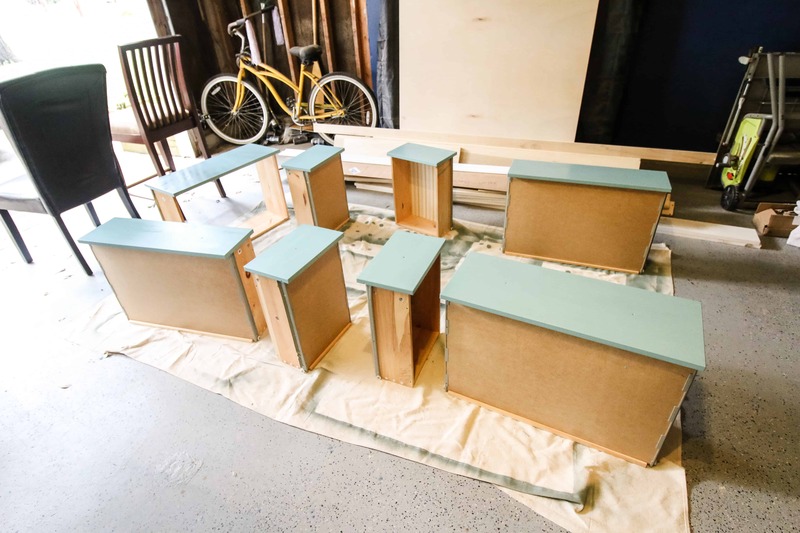 Stain the plywood base and legs a color of your choice. Attach the legs to the base and the base to the bottom of the dresser using a combination of wood glue and screws. 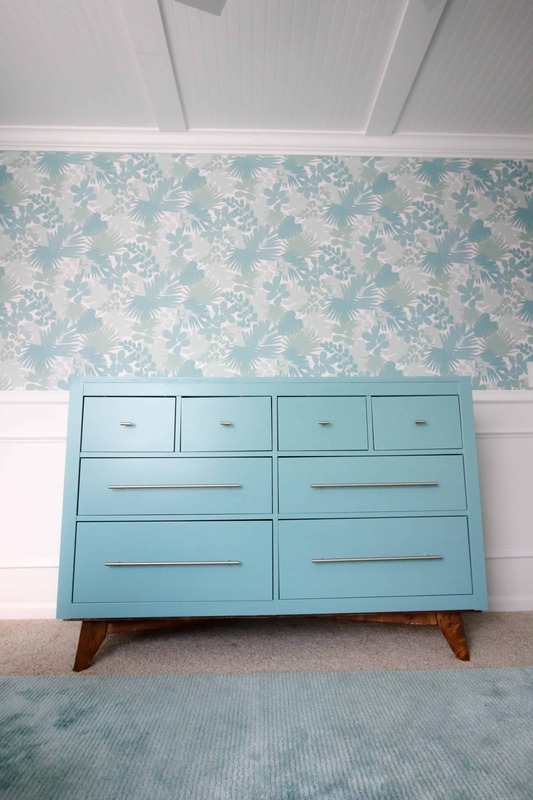 This IKEA Hemnes dresser mid century modern hack is a great way to bring new live to an old piece of furniture. We love the look of the base of the dresser and the more streamlined body of the dresser. Paired with the refreshed color and hardware, we’re swooning. If you want to attempt an IKEA Hemnes dresser mid century modern hack, remember that paint is very delicate on the IKEA pieces until it is cured and sealed. Any cuts will temporarily leave the dresser a little less solid until you recreate a new base as well, so always be careful. 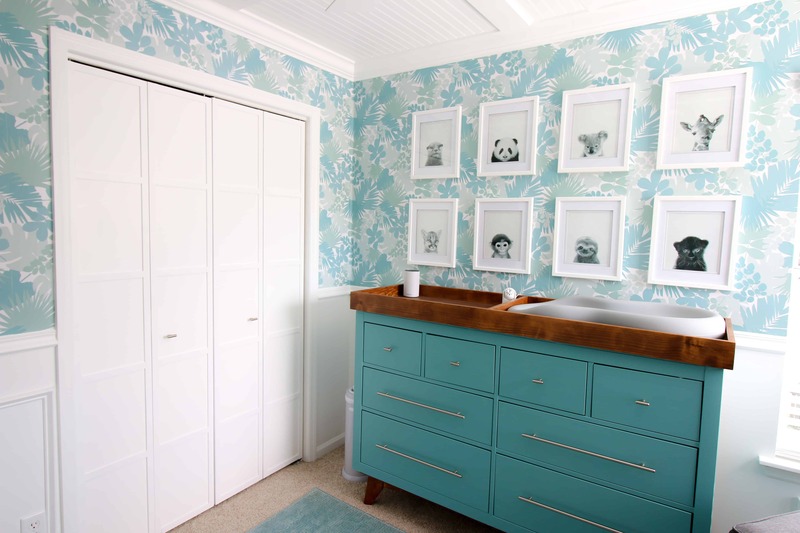 I love how this dresser looks in our tropical nursery and love the Tower Bridge color with our wallpaper. Swoon! I am digging the mid century modern feel and am excited to bring that vibe in with very similar legs on the crib! Here is the tutorial for the DIY wooden changing table topper. Click here to see more details on that gallery wall and check out how we made over the bifold closet doors! Share with us your creations! this project is so great! how did you saw off the “lip” overhang on the top of the dresser without damaging the rest of the dresser? I was actually hoping to keep the dresser black as it is, but it seems like we may need to paint it either way to do the hardware and after sawing off the top edges. Our new place will be very small – do you have any suggestions on furniture colors for a very small bedroom? Is black too dark? Hey Jennifer! We sawed off the lip by being very very careful (insert Elmer Fudd voice there). We traced a line exactly along the lip so that it would be flush, making sure to account for the width of the saw blade. Then we used a circular saw and followed the line flush and it turned out great. As for your color, black isn’t bad, but it depends on what you have going on in the room. Matching the color of the dresser to complement the wall color or other pieces in the room will make it seem smaller by blending in a bit. Going extremely bold compared to the rest of the room will make it stand out more and will make it feel bigger. Let us know if you have any other questions and please send us a picture when you’re done or tag us on Instagram so we can see how it turns out!! Did you have to drill new holes for the 15 1/8 in pulls? Hi Becca, thanks for stopping by! Yes, we did have to drill new holes because of this particular rod we got. It wasn’t a problem though. We filled the old holes with spackle and painted over them when we painted the whole thing. I imagine you could certainly find different pulls that were spaced the same. Hi! Thanks so much for posting these plans. Do you mind describing step 5 a little more? When you line up one of the leg sets on top of the other to form an X and then cut a gap into one, what do you mean by gap? Is there an angled cut? Did you just place the leg set on top of the other, rotate it until you got the depth you wanted from one leg across to the other? Thanks again, I really appreciate it! Hi there, this looks great! 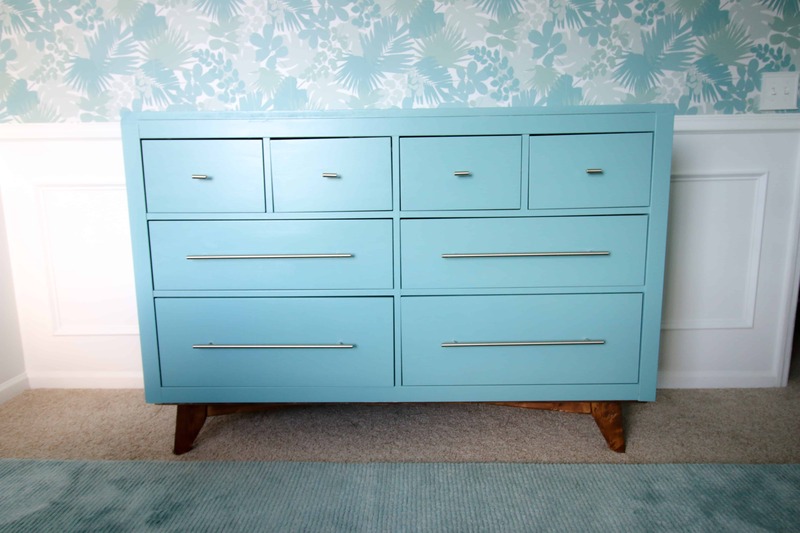 I have a Hemnes dresser that I love for my son’s things, but we’re painting his room navy and the dresser is also blue – would love to be able to keep it and update it! Did you sand your dresser down before painting it? Hey Lindsey! Yes, we did a light sanding job to try to help the paint adhere. That’s the thing with IKEA furniture is that since it’s not real wood, paint has to have a longer time to set. So we roughed it up a bit, but the bigger thing is to just make sure to let it cure a lot longer than with real wood. Thanks for stopping by!